Controversy: Australia full-back Israel Folau. Facing the sack, the 30-year-old has requested a hearing, with RA to make arrangements with the Rugby Union Players’ Association (RUPA) on the matter. “Israel has responded formally today to request a code of conduct hearing which, under the circumstances, was not an unexpected outcome,” RA chief executive Raelene Castle said in a statement on Wednesday. On Monday, Wallabies head coach Michael Cheika all but ruled out Folau’s chances of featuring at the Rugby World Cup. 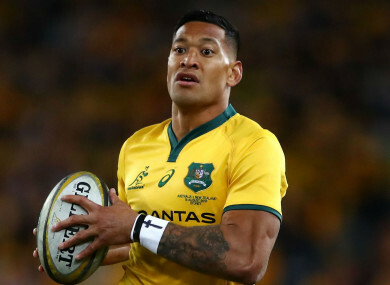 Email “Folau fights Rugby Australia sacking over anti-gay comments”. Feedback on “Folau fights Rugby Australia sacking over anti-gay comments”.